SpotCam is a relatively recent entrant in the DIY security sweepstakes, offering a trio of HD (720p) indoor and outdoor cameras. The $160 SpotCam HD Eva looks to muscle in—perhaps literally, given its bulky body—on the crowded Dropcam/Nestcam space with attractive features such as 24-hour continuous recording and motorized pan/tilt. A few peccadilloes, however, keep it from the top tier. You can forget about hiding the SpotCam HD Eva in plain sight—there’s nothing inconspicuous about this camera; it’s easily the bulkiest we’ve reviewed so far. The head unit is bigger than a tennis ball—which is typically the largest comparative size we see on DIY security cams—and the base is nearly as big. In fact, it almost looks as if they stacked two of the same cone-shaped modules one on top of the other. Inside that ample head is an IP camera ringed with 18 high-power infrared LEDs for night vision. The camera has a 110-degree field of view, which should be enough to take in most rooms. In the event it’s not, you can take advantage of the SpotCam Eva’s pan-and-tilt functionality. Using the Spotcam mobile or web app, you can pan the camera 360 degrees—180 degrees in either direction—tilt it up 50 degrees, or down 20 degrees. Motorized pan-and-tilt is also a nice feature for tracking pets or (hopefully not) intruders as they move through your home. SpotCam HD Eva also includes a speaker and microphone, so you can communicate remotely with family members or pets at home or scare off burglars with your voice. And, like all SpotCam’s, Eva can be used with IFTTT recipes to connect with other smart-home devices, including Philips Hue lighting, Nest Labs’ Nest Protect smoke/CO detector, and Amazon’s Alexa digital assistant. SpotCam HD EVA boasts many desirable features, but its pan-and-tilt is hampered by clunky app control. All surveillance footage is recorded to SpotCam’s cloud servers, and buyers get the SpotCam Live plan, which stores a rolling 24 hours of recordings for free. To store more, you’ll need to purchase one of the SpotCam NVR packages: 3-day recording for $3.95 per month or $39/year, 7-day recording for $5.95 per or $59/year, or 30-day recording for $19.95 per month or $199/year. Setting up SpotCam HD Eva isn’t difficult, but it is clunky. Using the SpotCam mobile app, I had to first to connect the camera to SpotCam’s Wi-Fi, then toggle to my phone’s settings to find my Wi-Fi network. Once I entered my Wi-Fi password, I then had to flip a switch on the back of the camera to put it in “client” mode before toggling back to the SpotCam app to wait for it to connect. Confirmation that this rigmarole worked is a still shot from the camera’s live feed displayed on the SpotCam app’s home screen. Tapping this picture takes you to the live feed itself. The Spotcam app is clean and intuitive, if a little unpolished. Directly beneath the live feed window are icons for turning audio on and off, capturing still photos of the feed, and a 30-second rewind. There’s also a button for sharing access to the camera in case you want multiple family members to peek in on the homestead. Tapping this opens a window where you enter the party’s email address, customize a couple of access settings, and add an invitation message. SpotCam HD Eva’s size makes it tough to conceal. The bottom half of the screen features a horizontally scrolling timeline and icons for viewing a chronology of detected sound and motion events, triggering the microphone, opening the settings tab, and getting back to the live stream. Both live and recorded video were sharp and vibrant during my use. Even in night-vision mode, the image had good contrast with plenty of detail. Many wide-angle lenses suffer from distortions around the edges of the image, but the Eva’s showed little warping. You control the camera’s pan-and-tilt feature by swiping horizontally or vertically in the desired direction on the live feed image. This operation is hardly precise. In theory, the length of your swipe should determine how far the camera pans or tilts (the app displays the degree of rotation). But sometimes the slightest swipe would send the camera rotating the full 180 degrees, while what seemed like a longer swipe would barely budge it. Other times, the app wouldn’t respond to swiping at all. 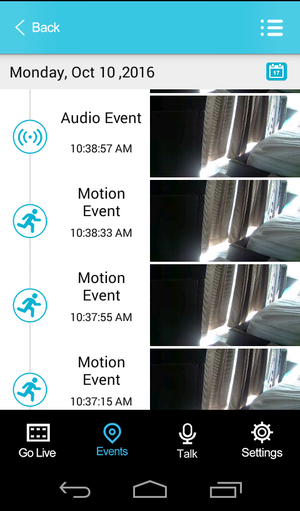 All detected motion and audio events are easily accessible from a chronological log. The SpotCam HD Eva can detect both motion and sound—the latter is always a bonus as you’re still getting some protection if something is happening outside the camera’s field of view. Detection alerts were timely and accurate in my tests. The SpotCam app offers a fair amount of customization to reduce the incidence of false alarms: You can set motion and audio sensitivity to low, normal, or high, and opt in to be alerted to motion or audio events, or both. You can also schedule alerts to be deactivated during certain hours or days, which means you won’t need to unplug the camera when you’re home. When an event is detected, it’s added to the event log. You just tap the event icon and select the event to see video of the triggering action. You can also access recorded events from the live feed screen by sliding through the timeline, but pinpoint accuracy is tough on a phone’s small screen. Also, sometimes trying to view videos this way caused the app to close and reboot. Although you can view recorded videos on the SpotCam mobile app, you can’t download them. For that you need to log in to the SpotCam web portal (which has all the same features as the app) and create a video from your surveillance clips. Once you select a period of time, you can opt to make a “normal” or time-lapsed video. The result is saved to a tab called My Film on the portal, from which you can download the video to your local drive. The SpotCam HD Eva has most of the makings of standout home security camera; unfortunately, some shortcomings in execution hinder its performance. Its bulky, non-descript design is curious considering how much emphasis other manufacturers—MyFoxand Neatmo in particular—have put on the aesthetics of their products. The clumsy pan-and-tilt operation diminishes what should be a standout feature, and the need to “create” a video feels like extra work. Maybe these things will be improved down the line. 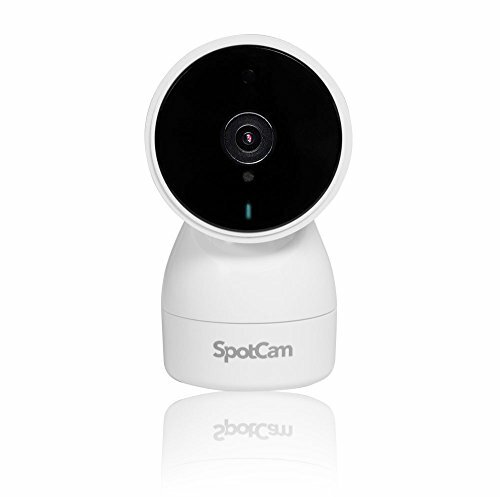 If you can overlook them in the meantime, SpotCam Echo still offers solid security for a reasonable price.